Amazing student work will be displayed March 12-31 in a prominent space within the School District Office. This is a great display opportunity for any student. Your favorite printed artwork from this course. 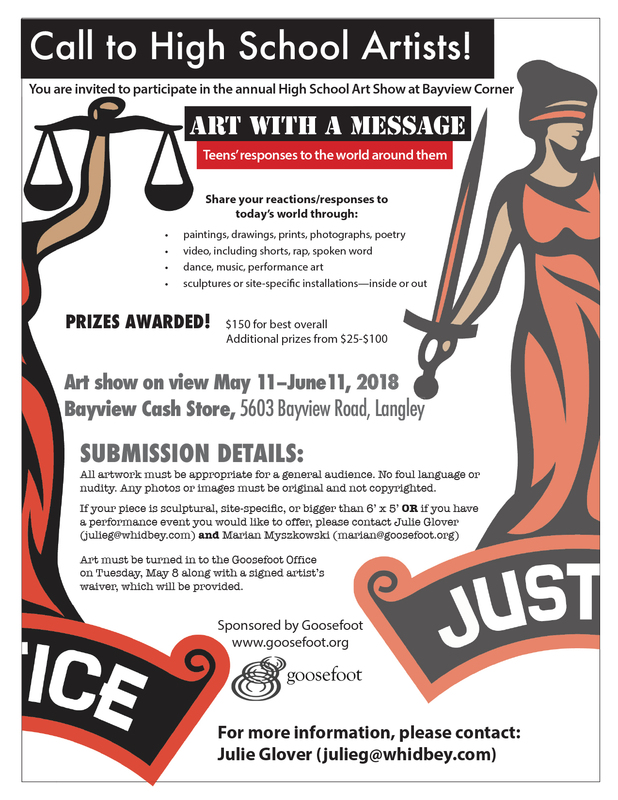 This is an art show for high school students hosted by the Whidbey Island branch of the American Association of University Women (AAUW). The show is divided into five categories: wall art, photography, jewelry/wearable art, sculpture and pottery. If you wish to submit something other than a photograph, talk to the other art teachers. Winners are VERY highly encouraged to be present at the reception to accept their prizes. Shutterbug Award of $100 in photography. This is given by our member, Nancy Hodges, in honor of her father, a professional photographer. Hosted by The Guild (OHHS’ art club), this art show features artwork created this school year by students in the art department. Sign up to participate no later than April 8, 2018! Artwork (photograph or design) that shares your reactions/responses to today’s world. Tell Mrs. Jansen you want to participate. Artwork will then be printed on special paper and mounted on mat board to present. This is a poster contest for Sexual Assault Awareness Month hosted by CADA. Students are invited to submit artwork for posters that CADA will be using for their awareness campaign throughout the month of April and the winner(s) will receive a cash prize, as well as have their artwork displayed throughout the county. Create a poster for this year’s car show hosted by the North Whidbey Lions Club. Submit to Mrs. Jansen by January 31, 2018. Hosted by The Guild (OHHS’ art club) and Oak Harbor Christian Reformed Church, the 6th annual end of the year art show’ purpose is to exhibit the extraordinary artistic vision of the Oak Harbor youth. This is an evening of art, music and food in a classy atmosphere. Submit artwork to Mrs. Jansen by May 17 if you want to participate.